One of my favorite events of the year is our annual Christmas party. It’s a time of the year we get to celebrate the season with those closest to us. You have heard me talk about our fabulous neighborhood and our great community of friends. Celebrating friendship and love during the holidays warms my heart and makes me appreciate all we have, so I’m sharing a few photos of our home decked out for the season and our annual Christmas party. I start prepping and decorating for the holidays in late October, and it takes me until mid December to have our home ready for guests. This event marks the end of my decorating for the season, and from now on I can enjoy all the blessings of Christmas. Enjoy the tour and welcome to our home. If you have a flocked tree, you may want to check out Tips and Ideas for Decorating a Flocked Christmas Tree 2018 and 3 Tips to Setting up a Christmas Tree Like a Pro. If you’re looking for new ways to make the holiday season easier, check out How to Remotely Control Your Christmas Lights from Anywhere…game changer right here folks! As I mentioned, the flocked tree was located elsewhere last year, check out “Modern French Country Christmas” Sunroom Tour and Remodel. The kitchen table is set for guests to sit down and enjoy a meal. We served a buffet style dinner. The backs of the chairs were adorned with hanging sprigs of red berries, greenery, and frosted pinecones. The middle of the table is lined with lighted birch garland HERE and white poinsettia plants. The centerpiece is an arrangement I made in my floral design class, all the details in my next post. We have extra tables set up to serve desserts in the kitchen. Guests brought a variety of decadent desserts to enjoy. How to Make a Rose and Eucalyptus Floral Arrangement Step by Step Guide. Two trees in the foyer add beautiful color and look so pretty side by side. Wish me luck as I am planning on a foyer renovation in 2019. These trees are decorated with favorite family ornaments we have collected over the years, from our wedding, the birth of our children, trips we have taken, through present day. I try to collect a few every year that have a special meaning to our family. Our kids get most excited about unpacking the ornaments for these trees and they always search for their favorites, the teddy bears win out. The foyer was set up with a few cocktail tables. I gathered the skirt of the tablecloth with a thick piece of wired 4 inch ribbon. The cocktail table centerpieces are a simple glass container HERE with floating candles HERE, real cranberries, and a bit of live cypress. The view from the foyer into the family room where guests will gather. My Paperwhites are in full bloom! They were planted at the perfect time, check out PaperWhite Blooms for the Holidays. 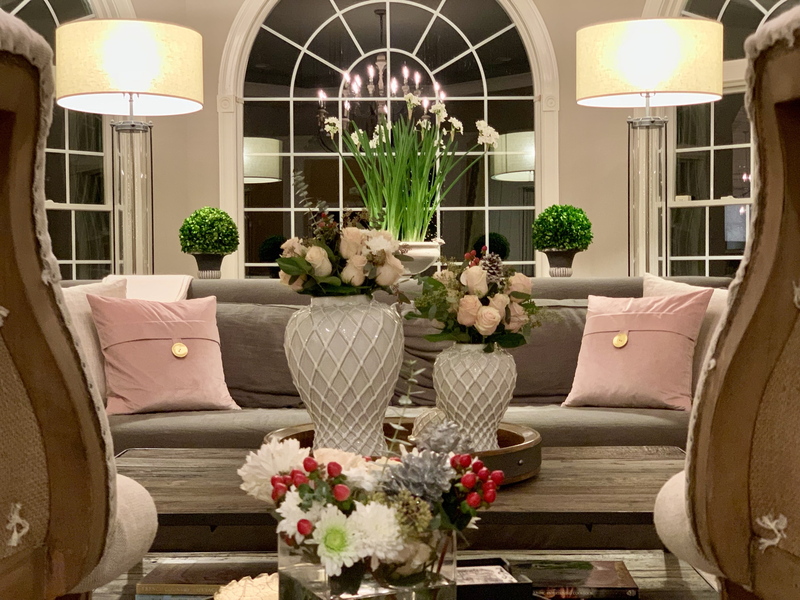 The Christmas theme for this room is soft blush, I added roses and greenery to my favorite ginger jars HERE. These blush pillows from Home Goods can be used all year long, Spring to Summer to Fall to Winter, for more information about the pillows check out How to Easily Transition From Summer to Fall Decor in 2018. The family room has a beautiful view of the kitchen tree. I decided not to put a tree up in this room like I did last year Family Room Christmas Home Tour 2017. Moving to the Sunroom, the garland hanging on the mantle from Mackenzie Childs HERE is adorned with gold, silver, and copper pinecones. The garland is attached with a bow I made, check out How to Make a Simple Holiday Bow with a Tail. The black velvet ribbon is also from Mackenzie Childs. I brought additional seating into the room for guests to gather in front of the fireplace. Buffet style dinner was set up in the Dining Room. The decor in this room included lighted birch trees similar HERE, HERE and HERE. I used a banquet size tablecloth HERE and added 4 inch ribbon around the top of the table. I secured the ribbon to the tablecloth using tape HERE and added a few pins for extra security. I placed bows on the corners and at the center of the table. With all the decorating preparation I do for Christmas, it is essential for me to have this party catered. My effort goes into the decor, and I have others handle the food. It works out perfectly and I am able to enjoy the party. The delicious dinner included Chicken Picatta, Beef Brisket, Scalloped Potatoes, Mixed Vegetables, Pasta Primavera, and Pasta with Alfredo Sauce. For more Christmas tablescape ideas check out Christmas Dining Room Home Tour 2018. And the highlight of the evening was our dear friend who sang for us and brought tears to my eyes, his voice is amazing and really moved us all. It was the perfect ending to a great evening. Hope you enjoyed the Christmas tour of our home and picked up some ideas for your next party. Thanks for following along, would love to hear from you, drop me a line. I wish each and everyone of you a joyous holiday season. You can see a video tour of our home decorated for Christmas on my Instagram Stories HERE. Subscribe to Happy Haute Home and don’t miss a post! Follow along on Pinterest HERE, and Twitter HERE and feel free to pin and tweet your favorite pics from Happy Haute Home. Whoa! Always enjoy your posts. This is just so warm and inviting but let’s face it, your friend surely stole the show – that voice! Your guests must have been thrilled. Sandy A.
Hi Sandy! Yes he did, he gave us all goose bumps, it was a holiday treat for sure! Thank you so much for visiting and commenting! Happy Holidays! Wow Denise……your home tour is simply stunning! I’ve already picked up some great, yet simple ideas, the wide ribbon and bows around the tablecloth, the cranberries and greenery with the floating candles, the swags tied to the chairs. Sometimes when I tour open houses I find neutrals can look too neutral and blah, but you really have a way of pulling everything together, and adding just the right amount of color. I’m sure your guests had a memorable evening, especially with the entertainment, and you look lovely in the red dress! Joan PS. And I’ll be checking out that white birch garland in the after Christmas sales. Hi Joan, I am so glad you picked up some ideas! A few simple touches can make a big difference in the look of your decor and add the perfect amount of color. I’m so glad you like it. Happy Holidays to you and your family! Hugs! This looks so festive!! You’re so far more prepared than I am. I’m still working on decorating my place. Thank you! It does feel very festive, we are enjoying it a lot. Taking it all down..that’s another story…but I won’t worry about that now 😉 Happy Holidays! Thank you for the kind words! I really appreciate you saying that, have a wonderful Holiday sweet friend.